"My heroes were Chaplin, W.C. Fields, Laurel and Hardy, Buster Keaton�I copied from them, but after you copy from them, you gotta superimpose your own personality on top of it. Then you can work, then you can find your own style." 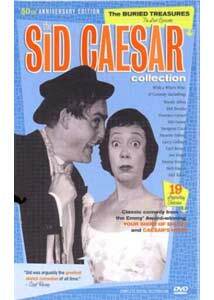 Like many a sequel, The Sid Caesar Collection: The Buried Treasures pales ever slightly when compared to the near-flawless original triple-disc set that inspired it (The Fan Favorites). But when placed against the standards set by that compilation, I suppose an anti-climatic response is natural. So am I implicating that this follow-up is merely a hodgepodge of leftovers and inferior bits slapped together as a cash-in? Not on your life. Although the batting average as far as total consistency is around .300, Treasures contains grand slam moments that would have been worthy of inclusion on Caesar's first career overview. In fact, some are among the funniest comic sketches ever committed to film. Rankin high in comedy mementos: At the Movies, with Sid as a typical movie patron, popcorn bag and all, who winds up as an innocent bystander in the middle of feuding lovers (Coca and Reiner, in flawless support); another edition of "The Commuters" (Caesar's Hour's Honeymooners-esque couple) as Nan (Fabray) hires a maid to counter Bob's (Caesar) slobbish ways, only to have it backfire in an unexpected, inspired turn of events; Caesar's brilliant pantomime of a classical pianist having a rough night during a performance of a Grieg concerto; and in the set's masterpiece, Toy Band, a Christmas-themed segment that give us an eager little boy sneaking down to open his tuneful gift early: a music box featuring a brass band circling around and brought to life by Caesar, Fabray, Morris, and Reiner in a manner that will have you doing a wipe-your-eyes and double take of your own. It's absolute perfection, until� well, think back on how you tended to overdo it with the likes of Fisher Price and Tonka to such a point that a return to the store (throat clearing), I mean-uh, Santa's workshop became necessary on December 26th. Although my only misgivings about both sets is the fast handling of interviews, comments from the casts of both of Caesar's groundbreaking shows get a tad bit more playtime on Treasures and it pays off with a lot of fun behind-the-scenes tales, including Sid's propensity for lifting a leg of the huge writer's table during brainstorming sessions (code for not liking a joke), his almost telepathic collaborations with Coca that made rehearsals almost unneeded, and the legendary comedian's amazing ability to mimic dialects, which comes to him via working in his father's deli as a small boy, exposed to the melting pot of customers. Other smile-inducing recollection highlights: Caesar being forced to go on stage after a one-minute costume change in a bus stop sketch complete with gladiator sandals leftover from the performance prior; writers encouraged to explore every conceivable angle in writing comedy; and the appearance of a young comedic ing�nue watching keenly from the rafters at every rehearsal and live broadcast she could get to, soaking up the influence of her heroes: Carol Burnett. Image Transfer Review: Like its predecessor, quality is spotty at times; evidently, some elements survived better than others. But on a whole, very watchable (and besides, its comedy history, folks. It sure beats having nothing but dust and memories). Audio Transfer Review: Fine Dolby mono (albeit listed as "Stereo" which only comes courtesy of modern day incidental music that accompanies the new interviews); manages to sidestep a lot of defects that mar un-restored moments that date from the early days of TV, including loud pops, surface noise and the like. Extras Review: Frustratingly light when compared to the first trip to the Show and Hour archives; the interviews are much too brief and there just had to be more material. But the three bonus sketches (especially the wacky Chinese Restaurant) serve as slight compensation. A fine companion piece to The Fan Favorites, The Sid Caesar Collection: The Buried Treasures offers more evidence of why the New York-bred genius has become so revered in the history of comedy.